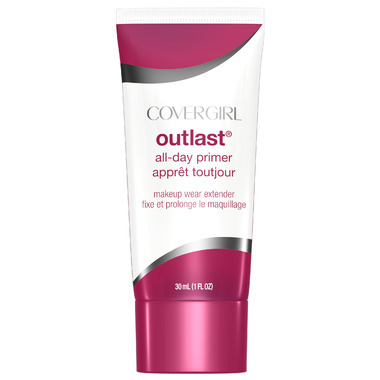 CoverGirl Outlast All-Day Primer is a great first step for applying your face makeup. This makeup wear extender preps the skin, hides pores and reduces the look of imperfections for a smooth, flawless effect. As a primer it extends the wear of your foundation and keeps it looking fresh, all without clogging pores. Suitable for sensitive skin. Directions: Apply a dime-sized amount to face before applying makeup to keep your foundation looking fresh and flawless all day.